Ritchie Bros. Auctioneers, the world’s largest auctioneer of heavy equipment and trucks, recently launched a redesigned (and more global) web site. Auction web sites are much like ecommerce web sites — that is, quite complex. You’ve got currencies and time zones and legal issues to navigate. 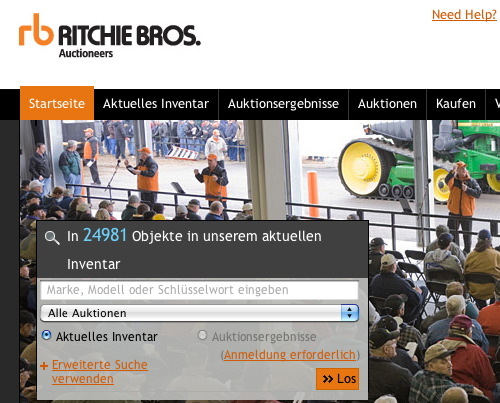 And, in the case of Ritchie Bros, you’ve also got real-time global bidding. To learn more, I interviewed Brad Cumiskey, Manager of Digital Marketing at Ritchie Bros. about the redesign. Established in 1958, Ritchie Bros. Auctioneers sells more equipment to on-site and online bidders than any other company in the world. The Company has over 110 locations in more than 25 countries and customers in more than 200 countries. Expanding our global presence has been an integral part of the company’s strategy for decades and the web site launch was a natural progression. Q: How many languages do you now support? And when did these go live? Prior to the April launch, rbauction.com offered varying degrees of current inventory equipment content in 16 languages. Although full service online bidding and account services were only available in English. Q: How long did the localization process take? Q: Did you rely on a vendor or do it in-house? And can you share a ballpark figure what you budgeted? We supplemented our in-house translation expertise with external translation agencies. Internal subject matter experts are charged as ‘language owners’ and are ultimately responsible for the final delivered translations. Q: What lessons did you learn that you can share with other companies planning to go global? Engagement from fluent, in-house localization champions is crucial. In our case, our ‘language owners’ helped resolve translation conflicts and advocated for the customer experience in their native language. Q: Any post-launch usage stats you can share? Any surprises? Last week alone, rbauction.com received visits from 204 countries, with 22% of all web site traffic represented as non-English speaking. At this point in our history, the non-English market continues to grow, and is no longer considered a surprise. Notably, we see steady increases in web usage from non-English customers when we simulcast with live auctions being conducted in non-English markets. Q: What was the most challenging language to add — and why? Q: Your local sites include a great deal of time/date/location data. How did you manage the internationalization and localization of this functionality? Date, time, and location information are maintained within the web site’s content management administration system. Wherever possible, the development team made strict use of the content management framework’s internal localization functions. Excellent multilingual support was a ‘must-have’ in selecting a content management system. In the software selection process we took pains to ensure the solution would meet our requirements and prevent us from having to ‘fight the framework’. Q: Not all web site features are currently available to all users. For instance, online bidding is available only in a third of the languages/markets. Are these limitations due to legal issues or simply a matter of rolling out in milestones? As we expand into new markets and extend our services to an ever increasing number of non-English speaking customers, we will undoubtedly increase the overall number of languages used for marketing and other customer-facing materials and services.